Color: Great density. Edges are deep purple and the bowl is virtually black. Nose: True Syrah. Lots of black fruit with a hint of smoke and vanilla. Clove component. Palate: Full bodied. Layers of dried fruit, berries, clove and tobacco abound. Hint of smoke. Finish: Very Long. Needs a big meal. Make sure you have big game or BBQ beef ribs for this one. Cellaring/Serving Suggestions: 8 years in proper conditions. Great with big barbecue beef ribs or your favorite game meat. Here is the beginning of our sports celebrity wine line. 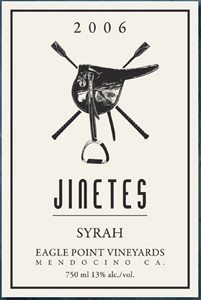 This Syrah is the first vintage bottled from famed jockey's Mike Smith and Alex Solis. I had tasted this wine two or three times prior to bottling and was so excited to see it come to our company as one of the first to offer it.